As we know for the Planar 2 ( and Planar 3), the motor is suspended to the plinth using a rubber band. No doubt it's effective to a certain extend for isolating the motor vibrations since the motor is not directly mounted onto the board. However as the motor spins, it also wobbles when the rubber belt stretches or contracts. As a result, there would be speed inconsistency. 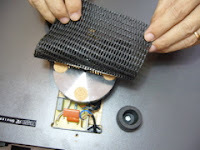 In other later models like P1, P2, P3, P5, RP1, RP3, RP6 TT's(with low-vibration motors), double-sided tape is used instead of rubber band to attach the motor to the board. This is a simple way to reduce motor vibrations from reaching the record surface and the stylus. But low vibration does not mean no vibration. The stylus is sensitive to vibrations that is micro in nature. There are many ways suggested to reduce this motor vibrations e.g by dampening around it or to upgrade to a low vibration motor/high performance motor. But, nothing is better than to "separate" the motor which is mounted to the plinth! Separating the motor from the plinth looks like involving a lot of work. Many might just wonder how easy is it for them to put the motor "off-board" or out-board? In my case, I put the motor "below-board" (also "off-board", of course). This is done without involving any drilling. i) Remove the motor by opening the the motor compartment cover, loosens the two screws holding the suspended motor, the bracket and rubber band. ii) Fix the motor onto the stainless isolation base, IB22 ( my "invention") either by screws or acrylic tape. iii) Change the rubber feet to slightly higher ones so as to raise the height to accommodate the isolation base, IB22. The motor is now anchored firmly ( by the weight of the isolation base) below the board by about 2 mm. iv) Align the motor pulley to make sure that the motor is not touching the board. This stainless steel isolation base, IB22, that I've used above not only acts as a vibration-sink, but also a heat-sink; the motor runs much cooler due to faster heat conduction as well as better ventilation. It actually out-performs the Planar 3 motor upgrade (click link to read comparison). In order that we can still move around the turntable (whenever necessary) with the motor/isolation base unattached to the plinth, I use a piece of rubber mesh netting to hold the assembly. 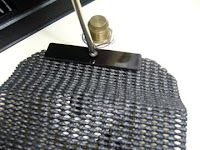 This rubber mesh netting covers the motor/isolation base and power supply compartment and is kept in place by plastic brackets using the existing screws holes (originally for the stock plastic cover). No drilling is required. Note: The rubber mesh netting is slightly slack and the motor base actually rests on the same surface as the turntable feet. It's not touching the plinth or hanging on the plinth/netting. Now you can sit back and enjoy surprisingly nicer music!!! 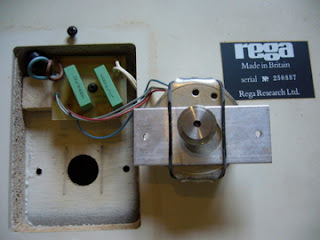 *Keep the original Rega rubber feet (3 pcs) and motor compartment cover as motor isolation base upgrade is reversible. 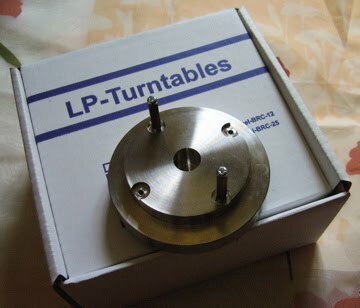 You may put it back to original Rega TT should you decide to upgrade to other TT's in the future. 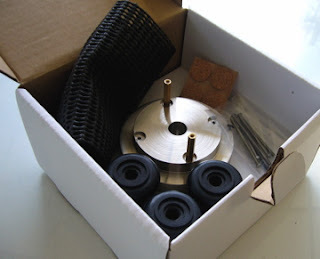 I got my motor isolation base and double pulley yesterday. Well since I have not received my puller for my pulley yet, I decided to install the isolation base anyway. So far after a couple of hours of play, I can honestly say this ; it is Silent! I can hear more detail, and the music takes on a living, breathing thing! I guess the more silent you can make the table, the greater analog experience it becomes. I listened to the P3 today with the motor isolation base, and here are my findings. it sounds more human than it has a right to. every record that sounded screechy or was on the borderline acceptable is now a pleasure to listen to. this is besides the subplatter replacement in my view ,the biggest upgrade so far. I just completed Michael Lim's motor isolation mod and add his double pulley but don't yet have a second belt on. 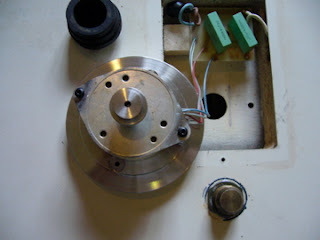 By removing the motor from the plinth, the music has just lept forward in a big way. More dynamic, wider presentation, quieter background, tons of bass on and on. Just can't get over all the 'tunefulness' this latest motor mod has done for the table!! The base was the biggest improvement. As if I have a whole new, tuneful record collection. Now there is refinement, clarity and accuracy on top of that . My wife last night mentioned how good an album sounded, Grieg's Lyric Pieces played by Gilels. This is a rare occasion for her to notice, and I believe speaks to the improvements of the tweaks. Got the isolation base installed, no problem - very nice indeed ...... . Now I have NO trace of motor noise at all - totally black background that the table to reveal all details - great design and idea on your part - well done. I've completed your motor isolation mod and my turntable is making ..... is making beautiful music. I haven't used the netting, I like to see the shiny base under the turntable. I only needed 3 spacers at 50mm x 2mm. I then made a minor adjustment to the pulley on the spindle to get accurate alignment with the two belts. You might want to mention that this is the better option if anybody is intending to use Rega's white belt upgrade. My Planar couldn't manage the torque on the white belt (due to the fact that the motor is suspended on rubber band)! 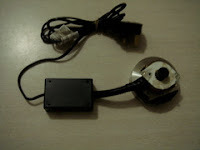 I was surprised and delighted to receive the motor base the following Friday after you shipped(6 days to the UK). I use the word ship, advisedly as it got here faster than the Higgs Bosen particle. My last four upgades have been your esteemed dual pulley/Rega 24v motor and Rega psu and now the motor base. Together with other notable added quality components. My bog standard Rega P25 can now manifest the spirit of passion and glory in music making. " The Motor base arrived right before Christmas. Installed it this week. First impression: More detailed sound with more "blackness", more "depth of stage" and more "space inside the music"; the different details and instruments are more separated. So far I'm happy. More listening with albums still to come. Michael, The Motor isolation solution is brilliant! The motor isolation is absolutely astonishing, As is, the turntable sound infinitely better than it has before. I'm VERY HAPPY with the difference your product has made to the sound on my Planar 3. It's very noticeable that everything about the sound is more detailed and solid. The bass improvement is amazing, it goes right through the floor now! During the years I have upgraded my Planar 2 with some Michael Lim aftermarket products, and I have to say that they are both cost-effective and easy to install. The motor-isolation base proved to be an excellent upgrade for me. The motor base arrived yesterday and I have just installed it. From the very first tests what it showed was a whole new level of silence, with lots of detail popping out with ease. I'll keep testing throughout the week and I'll let you know, but first impressions were really great. Thanks again for this great upgrade. 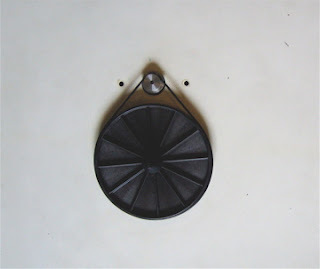 This isolation base is also suitable for most Rega and Pro-ject turntables as well as some Thorens models. The isolation base does make a big difference, I don't hear the motor since it is well isolated from the plinth. Thanks again Michael for the invention. I now enjoy listening to my table more than listening to CD's." The motor isolation base arrived safely yesterday. I was so excited, so I started to work on my turntable immediately. I separated the motor as you and others suggested on your website. One more check and connections, test drive and no more motor noise! Perfect. Convenient to those who are spinning a few Rega TT's. This can be a common motor! Also it's easier to move around your turntable with this option. is the ib22 still available for purchase?